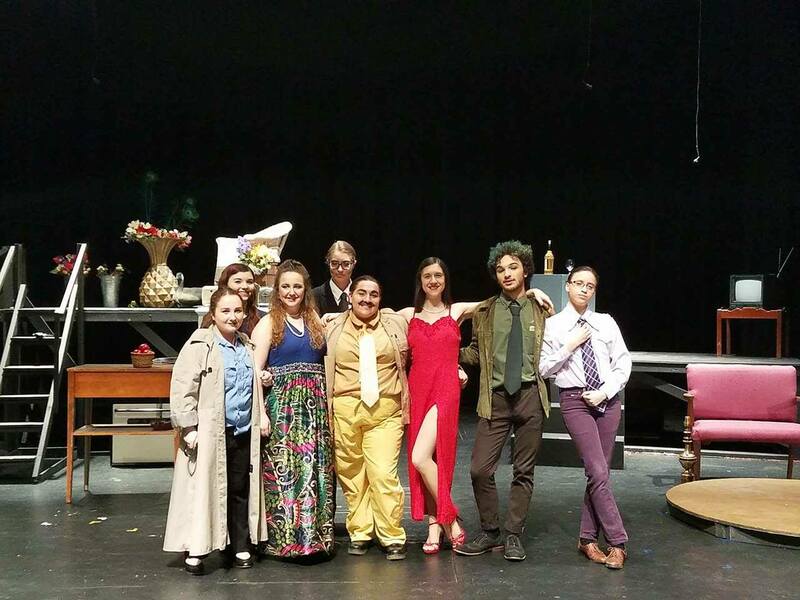 Last weekend, the Chatham University Drama Club presented their production of “Clue” at Eddy Theater. The two-show run drew moderate crowds, and many audience members returned the second night because of the show’s exciting plot twist: the audience gets to choose the ending. The show followed the plot of the classic board game of the same name, with familiar characters (or suspects): Professor Plum, Mrs. Peacock, Miss Scarlet, Colonel Mustard, Mrs. White, and Mr. Green. The show also introduced new characters such as the narrator, Mr. Boddy (played by Bethany Bookout, a junior sustainability major) and the detective (played by first year psychology major, Sara Strassner). At the beginning of the show, audience members were chosen to select the suspect, weapon, and room of the murder, and were encouraged to play along using the score card on the back of their program. Throughout the show, the audience got insight into Mr. Boddy’s masochistic obsession with his own death, as well as each character’s possible motive for killing him. In the end, those audience members who were correct in their “accusations” were asked to stand and were applauded clever detective work. The inclusion of the audience in the show made it compelling, however it was the witty one-liners and actors’ over-the-top portrayal of the characters that put the show over the top. The show’s director, Krista Arena, said choosing the production for the spring show was not without complications. The board considered a number of shows before settling on Clue. They made the decision to push back that production to fall of 2017, and decided upon another show that the club was interested in: a murder mystery. However, they had trouble with this show as well. “Doing more research about that particular show, we decided that it wasn’t as fitting to our Chatham audience as it could be, so we tried to find a close alternative,” Arena said. The audience participation in terms of the ending presented an interesting dilemma for the cast and crew of the show. With over 200 possible endings, the cast had to be prepared for any and all possibilities. This entry was posted in News and tagged Allison Albitz, Bethany Bookout, chatham university drama club, Krista Arena. Bookmark the permalink.